I have always had a lifelong passion for riding a bicycle. I enjoy exploring new places and feeling the breeze against my face. While I am on a bike, I find it easy to pray, think and even relax. Though people in my community may find it strange that a man of my age is always on a bicycle, but I still find the urge to ride a bike to be irresistible . Where did my passion to ride a bike begin? When I was around five years old, I inherited my brother’s sixteen inch bike. It was a challenge to learn, but my family patiently helped me to learn. I would ride this bike on our front sidewalk or sometimes in the alley. It was a bit rusty and the rubber tires were wearing out, but it was still a bike. My sister trying to show patience with me as I learn to ride a bike. 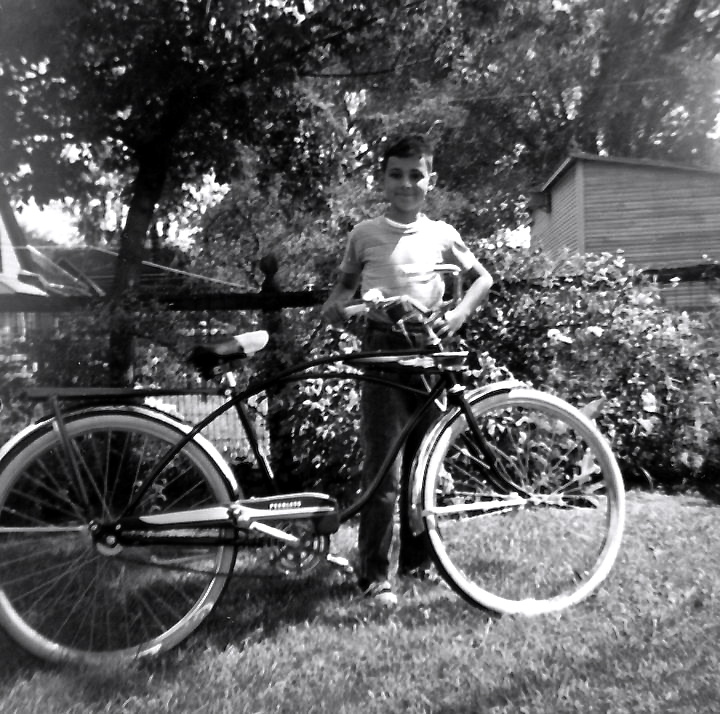 On my ninth birthday, Dad and Mom thought I was finally big enough to ride a real bike. The bike they bought me was a real beauty, which was made by Peerless. It had large twenty-six inch white wall tires, chrome fenders and a very comfortable seat with springs. Dad knowing my love for keeping track of speed and distances also placed a speedometer/odometer on the bicycle. I was finally able to ride in style! My parents gave me the boundaries in which I could ride the bike. They said that I could go around the block on the sidewalk and I could also ride in the back alley. I wasn’t allowed to cross any streets or ride on any street with it. I would accept these limitations temporarily, but as time went by I would explore other neighboring blocks while staying on the sidewalks. I still had a great respect for cars and what they could do to a child on a bicycle. 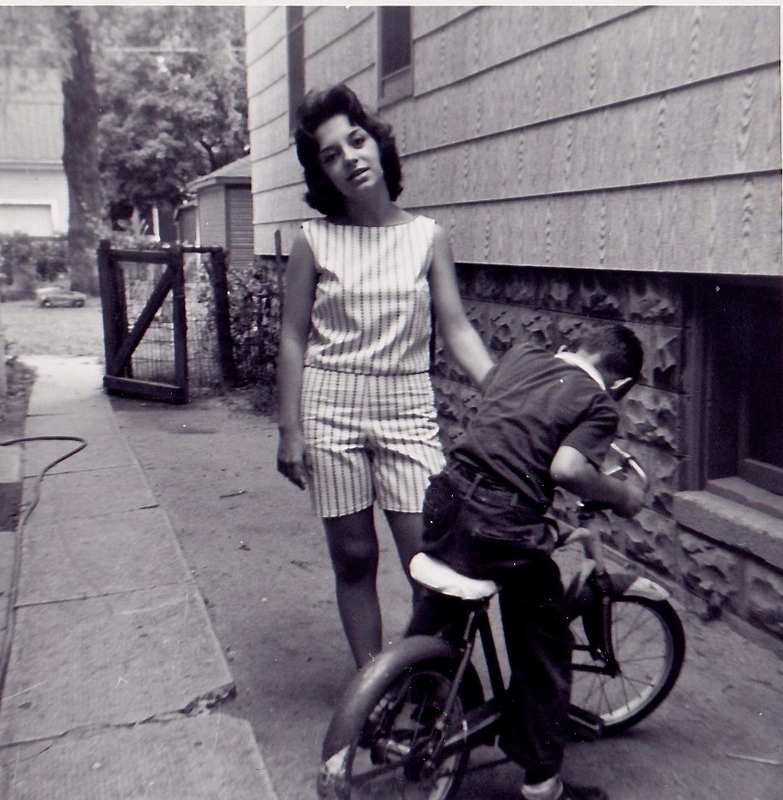 My first day, I was so excited about my new bike that I rode it around the block continually. By the end of the day, I had ridden my bike twenty miles! I had felt a freedom that I never felt walking or even riding my sixteen inch bike. Having this new bike was like I had reached a milestone in growing up. There was a problem that I soon discovered with my bike. The bike had to be left outside. We had no garage to store the bike. Dad purchased a tarp to place over the bike which was placed on the side of our back porch. This helped, but my battle with rust seemed like a never-ending battle. Rust would appear on the fenders as well as the rims. I would try to use a cleanser like Ajax to take off the rust. Unfortunately, it seemed to take away the luster of the chrome as well. This battle with the rust was very wearisome. Like most children during our era, I also enjoyed placing a baseball card in the spokes, which would make a noise that I could pretend was my engine. I sure hope I never placed a Mickey Mantle card there! In my preteen years, I never did ride too far from my neighborhood. I would ride around the sidewalks at Ford Park. I would also sneak off and explore the other side of Woodward Avenue, as well as an area of Detroit that was north of McNichols and west of Oakland Avenue. My first real bike would last into my early teen years. Later in my teen years with a different bike, my urge for exploring would take me throughout the Detroit Metro area, including Windsor, Canada. Yes, in those days, one could ride a bike on the sidewalk of the Ambassador Bridge. Even when I had a driver’s license, this inner urge to ride would take a hold of me and I would ride thirty or forty miles in a day. My first real bike is now a distant memory, but my love for riding a bike is still with me. I enjoy exploring new roads, towns and bike trails. Maybe, I do this because it is the one thing I can do as an older adult that I did as a child. Little did my parents know what they did when they bought me my first real bicycle.